Thank you so much Kim for inviting me to share with you and your readers my favorite room. 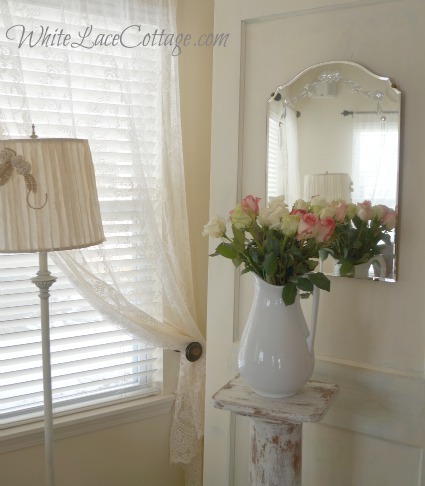 I am honored to have a room featured on your beautiful blog! Hi, I am Anne from White Lace Cottage. This year we will be in our home for 7 years. Boy that time has gone by fast. Although my home is not old I love the farmhouse cottage look. I thought I would share my kitchen and a bit of my family room since it is connected. When we purchased our home I picked out maple cabinets with cherry stain.Thinking I wanted to change my look. My last home was more feminine with more pastels and pinks. But after moving in I realized I was not happy changing what I already liked and that is all things vintage. I know it is not for everyone, but I have always had a fondness for things that are imperfect. I painted my cabinets last spring and almost a year later I don't regret it at all. I love the warmth and serene look of white. I love finding old architectural pieces like old windows, doors, posts anything interesting to my eye. I added that old ladder to connect the two cabinets. Inside you will see the color is a bit darker.I painted and added some dark wax to make it appear to be older than they are. The knobs were all found at thrift stores. Originally brass I painted them to appear as they were verdigris. I find most things at thrift stores, garage sales and antique shops. 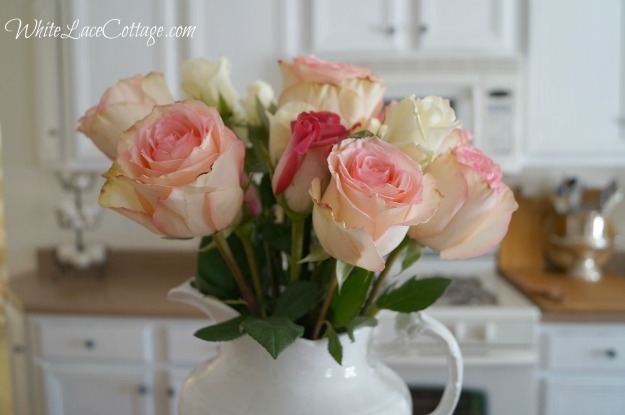 I love adding fresh flowers and roses are a favorite of mine as lilacs,hydrangeas and lavender. They are usually pretty cheap at my market. Although I can't always bring home roses I get what ever is on sale that week. In the summer I like to bring fresh flowers in from my garden .If I they are blooming well I can find them at our farmers market. 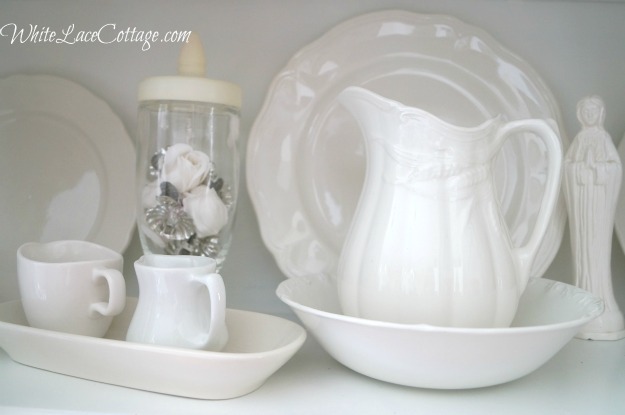 I love finding white ironstone or any pretty white dishes, pitchers, platters or mugs. They are displayed in this french cabinet and also throughout my kitchen,but they are also used every single day! This table was in my studio but decided to use it here and now that table that was here is in my studio. I am always shopping my home and changing things around from one room to the next. Since my kitchen and family room are connected we use these rooms the most and it is nice when we are entertaining. 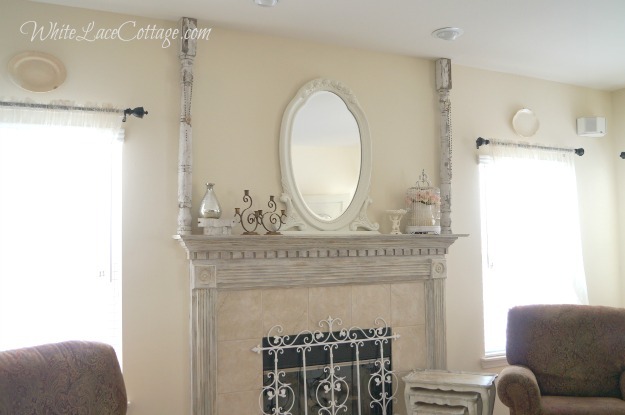 My mantle is a typical builders model.I decided to change it a bit and antique it using chalk paint and milk paint. 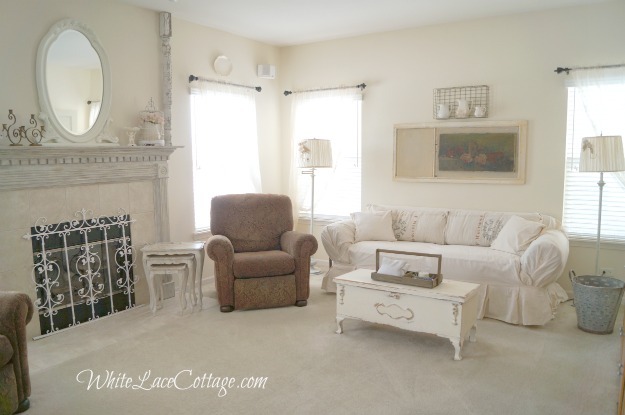 I painted the walls of my home a warm white.It works well with wood and brown or neutral colors. I recently added those posts to the mantle.I just cut down the size I needed with a hand saw. A ornate metal piece found at hobby lobby was painted white.This was on sale a few years ago it was 10.00. Stacking tables found for a thrifty price at an antique store. Mirror was also found at a thrift store for 35.00. I like using lace curtains. I love the softness of the lace and how it filters in the light.We also have blinds for privacy at night. Thank you so much for stopping by. I hope you enjoyed viewing my favorite rooms. I would love for you to stop by White Lace Cottage. 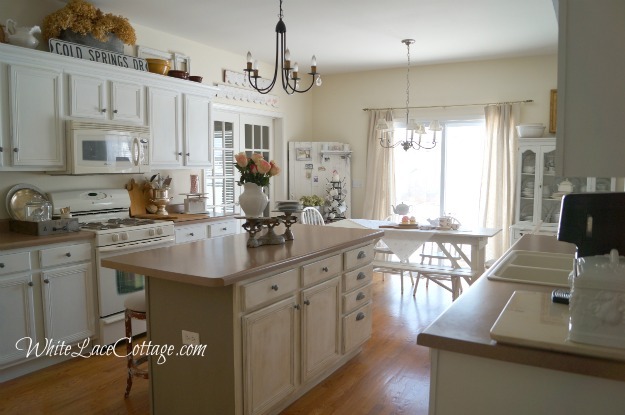 Thanks Anne for sharing your quaint cottage farmhouse style kitchen with us. 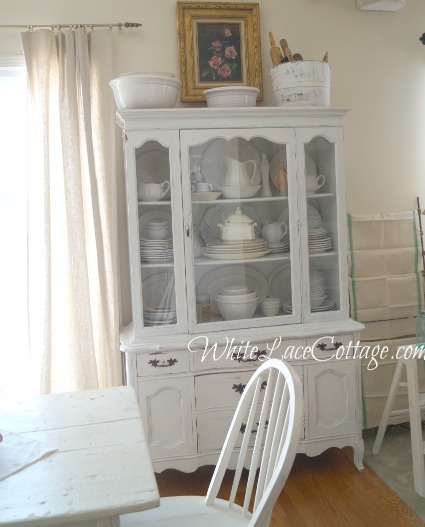 I hope y'all will pop on over and visit Anne at White Lace Cottage and say hi. Miss any past guest bloggers? Find them all HERE. What a lovely kitchen, breakfast area and family room. Love all the vintage touches. So pretty! Thanks for showcasing Anne's beautiful home today. Anne, thanks for allowing inside for a peek. I am a big fan :-) But then you know that. Hahahaa.. luv all your architectural finds. 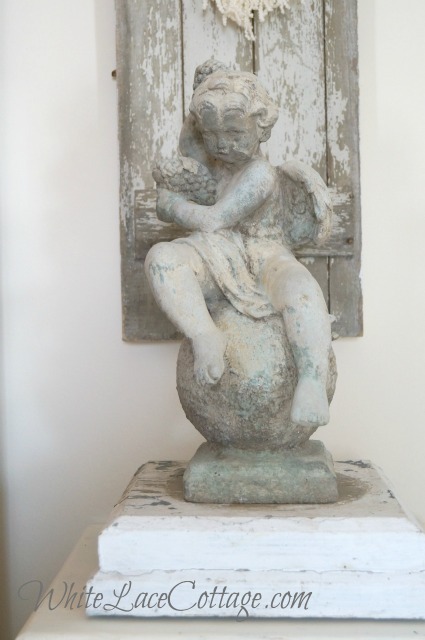 Anne's home is beautiful and is filled with so many fabulous pieces! Anne I LOVE your bar stools!! Great feature Kim, have a great weekend! Beautiful home! It has a very inviting feel. 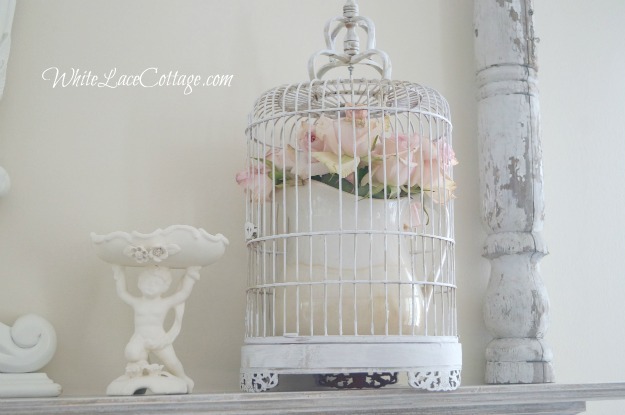 I love your featured favorite room/s guest blogger today - her space is lovely and so serene. What a pretty, serene tour! Anne, thanks for sharing your home with us. I like the look you've created. Love that mirror...great score! Kim, as always, thanks for introducing me to a new blog...heading over to check it out now. That is just so lovely! I love how well the two spaces splend and flow together.Just beautiful! What a beautiful, warm and inviting home. That's not easy to do with a light pallet of color, and it's just stunning here...thanks for sharing. Oh my..what beautiful rooms...Anne, I love how you use the architectural elements throughout..I love all of your pretty vintage pieces and collections! Thanks Kim for presenting Anne's favorite room today....I so enjoyed this gorgeous tour! You can tell Anne has a lot of fun decorating her home. Love her use of architectural finds and great doors and chippy tables. 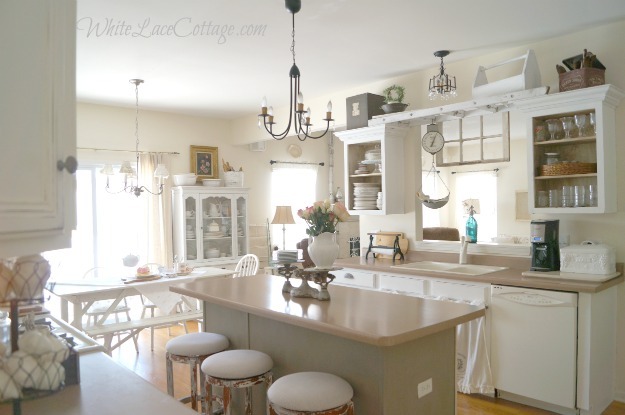 I always love seeing Anne's cottage/farmhouse styled home! Thanks so much for sharing! What a lovely warm kitchen...love the soothing whites and neutrals. What a lovely and serene home you have-it is so beautiful, thank you for sharing. Hi Kimmie! Oh, I love her beautiful kitchen. I could live in there. Thank you for showing these lovely rooms. I love Anne's home it is so soft and beautiful. Thanks for the post I always enjoy looking and admiring peoples homes. Your home is stunning...you have quite an eye for detail. Such a beautiful kitchen...thank you for sharing it with us! This is a beautiful kitchen. I just love it! Congrats Anne! I just adore your kitchen and family room. They are a perfect reflection of you! 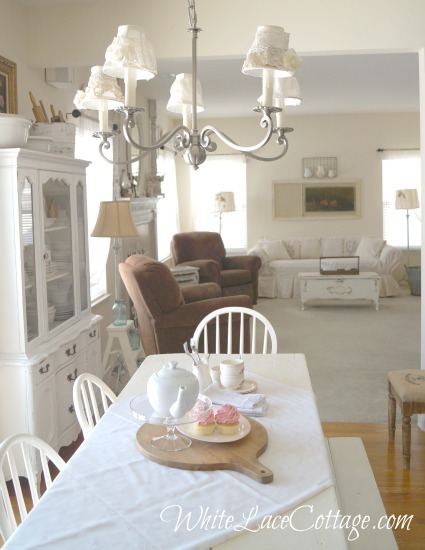 I love Anne's home--so beautiful! 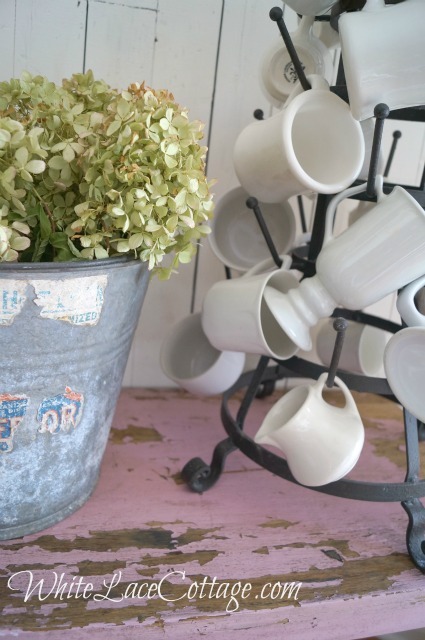 Anne's done a wonderful job transforming her new home with vintage finds and lots of white paint. Congrats to Anne on her featured rooms! Kim, I don't know how you keep finding all of this great inspiration. Is there any wonder we all want to keep changing our spaces? Love this one. Great feature Kim! I love Anne's home especially her kitchen. I loved seeing more of Anne's home. 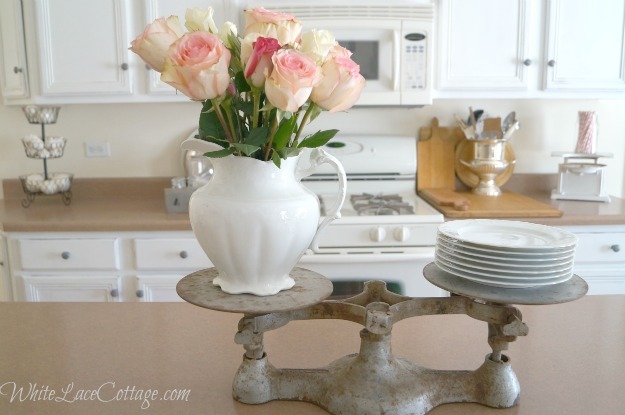 She has incorporated some great ideas and items into her kitchen. I especially love the ladder between the 2 cabinets with the scale hanging from it! Annes home is as warm as she is~what a nice tour and to hear Anne tell all the ways she transformed her house was great. Nice feature! I love Anne's home. So cute and inviting. I really liked the silver champagne bucket holding utensils. Thanks for featuring her, Kim. anne's style is so soft and pretty. i just love her beautiful home--tfs!